Letchworth Garden City is an odd place but well worth a visit. Its oddness is the attraction. 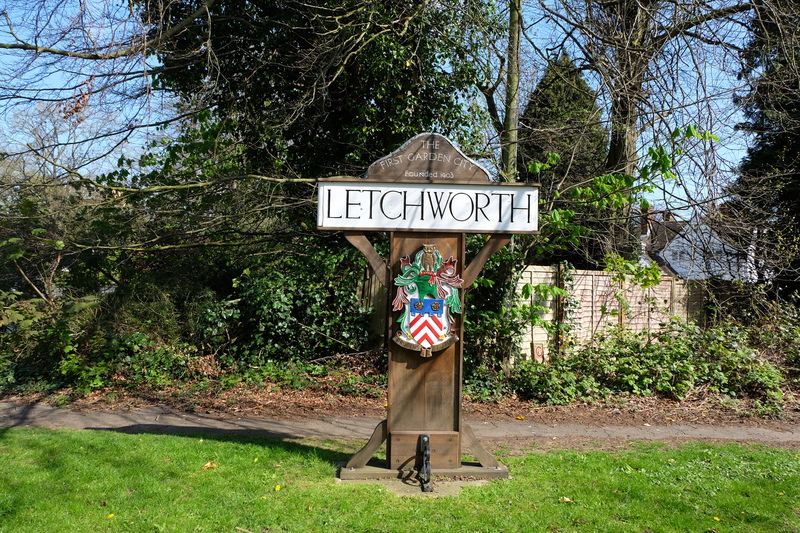 Around a dot on a map – the old village of Letchworth – a new garden city was envisaged by quaker Ebenezer Howard in the late 1800s. The idea was for social reform – for people to live in a community where they could breathe fresh air, reconnect with a countryside idyll and escape the smog of industrial Britain. The new garden city was designed and laid out by urban planners Barry Parker and Raymond Unwin and went on to inspire garden cities the world over. Its success was possibly because it was devised without the central diktat that often accompanies new age projects. It left its denizens or “pioneers” to decide matters rather than a preacher. I came here to complete the Letchworth Garden City Greenway – a thirteen and a bit mile path that circles the town, but also to check out its beer culture. Tracing the circuit has twice defeated me now. Even the woman in Tourist Information who gave me the map – a native since birth – admitted she got lost when she tried to follow it. Within minutes of leaving the town centre, I find my first marker badges at the entrance to Standalone Farm and I’m soon exploring rolling crop fields. Church spires and water towers appear in the distance like the masts of ships on the heaving sea. The landscape sits somewhere between rural and urban. The soundtrack is a combination of roads rumbling and the celestial symphony of skylarks. I get lost pretty quickly. I negotiate my way though wave after legion of tidy closes and crescents. Communal greens here are huge. Last week I was ejected from the Greenway into an industrial estate. You feel like a bit of a prat finding yourself on a building site with binoculars and camera. The builders probably thought I was a niche pervert. The week after my trail goes dead and I trudge along the main road from Baldock. The binoculars do lend an advantage here: you can read roundabout signs a long way in advance and decide whether or not to swim through the blue exhaust fumes in that direction or turn back. Back in the town proper, walking around Letchworth Garden City is a bit like wandering around an elaborate film set. The buildings are faithful reproductions from around the Tudor age – old enough for lichen to have accumulated on the pitched roofs but too young for any subsidence or warp. Historical buildings minus the history. These green streets of tidy period cottages look ideal – but it also makes them creepy. The Spirella building – what used to be a clothing factory – is so vast that to get it all in one photo, you’d have to take it from satellite. It earned itself the moniker Castle Corset. It just seems too big for a British venture and in fact this is the case – the company was from the US. In a way, the pioneers that came to settle here were proto-hipsters. They were generally middle class and associated with the arts and crafts movement. They were big on theosophy, vegetarianism and ascetic clothing – namely smocks made from Ruskin flannel from the Isle of Man and sandals even the middle ages wouldn’t touch. Apart from some private clubs and hotels, Letchworth Garden City didn’t have an actual beer pub until the early 1970s when the Black Squirrel (no longer there) was included in a new town centre redevelopment. In fairness though, up until that point the temperate intentions – from families who witnessed the capital’s gin melancholy – were democratically instituted each time through local vote. They opted against for most of a century though there was friction amongst some men that the vote kept not going their way because the women’s vote (mostly nays) was included here before the Suffragettes gained it nationally. 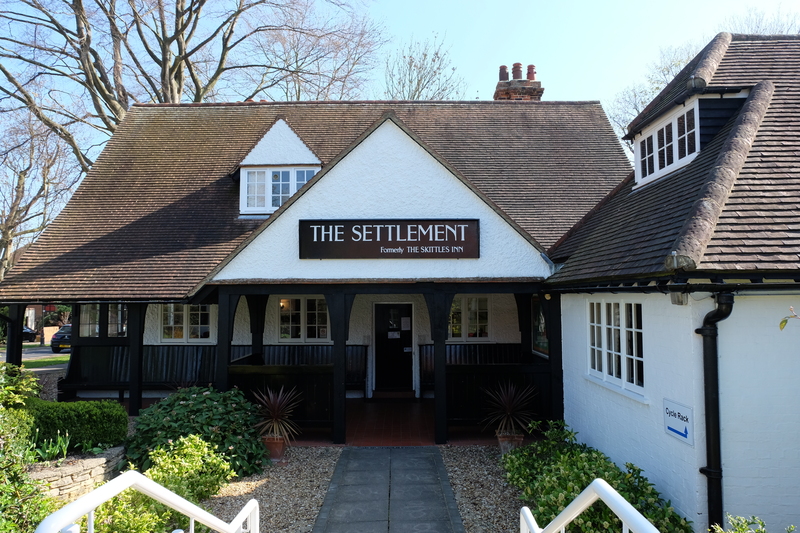 There was a public house instituted by the First Garden City L.t.d called the Skittles Inn that served food, had a skittles alley, a library and sold absolutely no alcohol. Instead, the staples were Cadbury’s drinking chocolate and Cydrax – a non-alcoholic apple wine. Lover of beer though I am, I can appreciate a public house that kept men sober – especially with the high rate of what we’d now deem violent alcoholism in many working families. But let’s never forget that it was this vision of Ebenezer Howard’s that also inspired prince Charles to cough up the hideous settlement of Poundbury; a village that sounds like a discount home store but has less class. The early citizens employed the word temperance correctly – to temper something is to moderate, not to forbid. 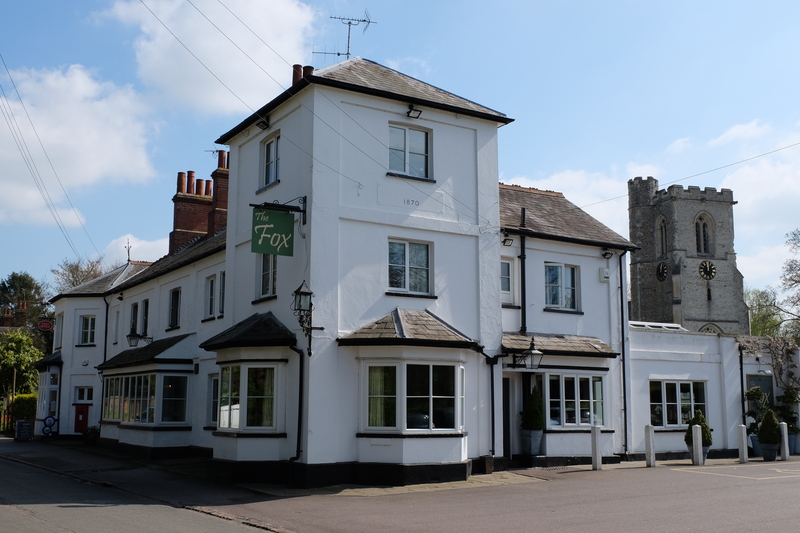 The First Garden City L.t.d also ran two more pubs about a mile from the town centre: the Fox at Willian and the Three Horseshoes in Norton. Both were allowed to serve alcohol. So if you wanted a pint, you simply girded your smock and went for a stroll in those sandals to get it. The local Wetherspoons is called the Three Magnets and is a decent gallery in itself showcasing the garden city’s history. Wetherspoons pubs are good at gathering local curiae and being museum-lites. There are, for instance, paintings of Ebenezer Howard and information plaques about Spirella corsets that changed the manufacture away from whale bone. If our boy Howard were alive today he’d absolutely love Powerpoint. But the jewel in the crown here isn’t the Wetherspoons, courteous as it is to its host, but a newcomer: the Garden City Brewery down the picturesque shopping lane called the Wynd (as in WIND-up toy). Every Thursday some cask ale in stellar condition is tapped and served from gravity along with some guest beer engines. If you’re lucky, you might also get your chops around a Bedfordshire Clanger – a home counties take on the Cornish pasty with meat at one end and fruit at the other. The pudding side has score marks in the pastry so you know which end to devour first. Spring Saison is the perfect thirst quencher. A 5.3 ABV spritz of a beer; it leaps over the gullet and fizzles on the roof of the mouth. Then the glass is empty. To CAMRA members, £3 a pint. Proof that a trip to Letchworth Garden City is good for you. The venue is filled with light. It’s airy, colourful and tidy. 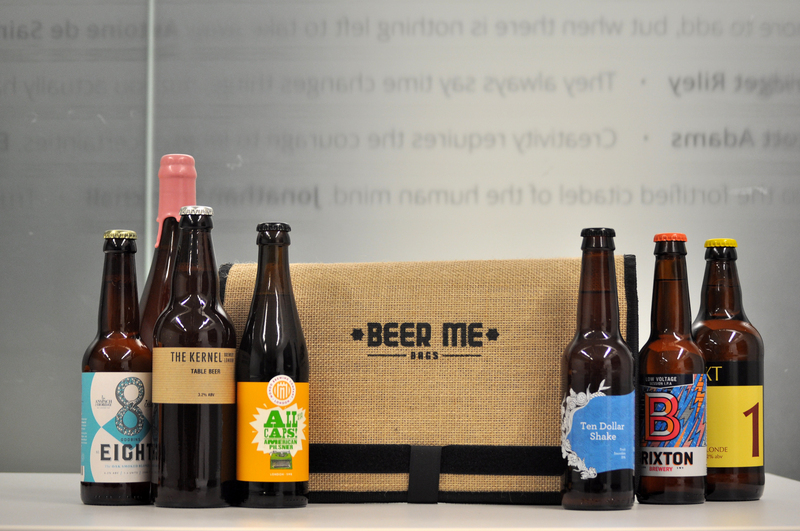 Donations are made from some of the beers to local charities so even in its own way, Garden City Brewery keeps the local legacy of community and betterment alive. You can still get a feel for Letchworth’s new life roots: it’s to be seen in adult education centres, urban farms, an NHS clinic calling itself a wellness centre and the International Garden Cities Institute. 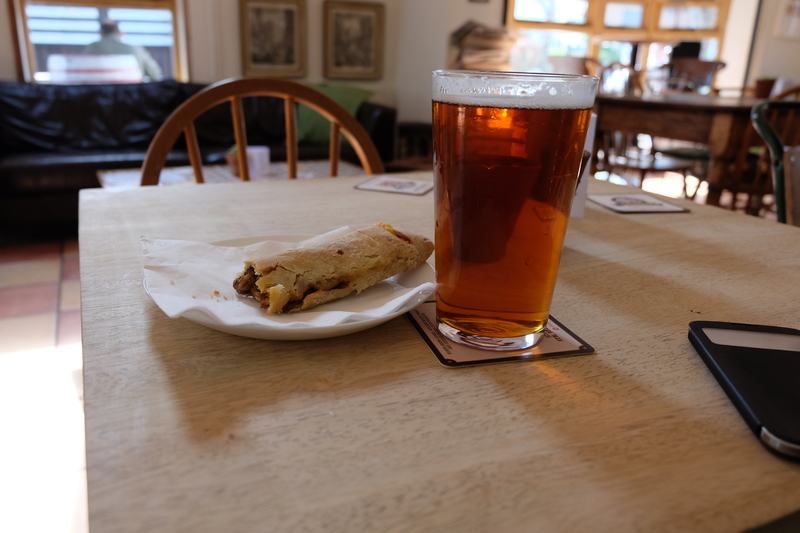 a pint of the brewery’s own Armitage ale and a Bedfordshire clanger. Neither lasted long. For its size, Letchworth now has at least the national average of pubs. So what caused the city to abandon its spirit of temperance? Well the context that spawned its necessity faded. Britain’s industrial age passed away so the very thing the garden city was set up to escape – the drudgery of the factories, mills and pits – disappeared from Britain. During the queen’s coronation, members of the first migration celebrated together and reminisced about the difficult first few years while the town was being shaped. Many people that left for this corner of Hertfordshire really did find a better life in the long run. This re-imagining is what makes Letchworth Garden City’s odd outlook so unaligned with the rest of Britain.